NETWORK FINALS: There were no adjustments from the preliminary Saturday ratings. 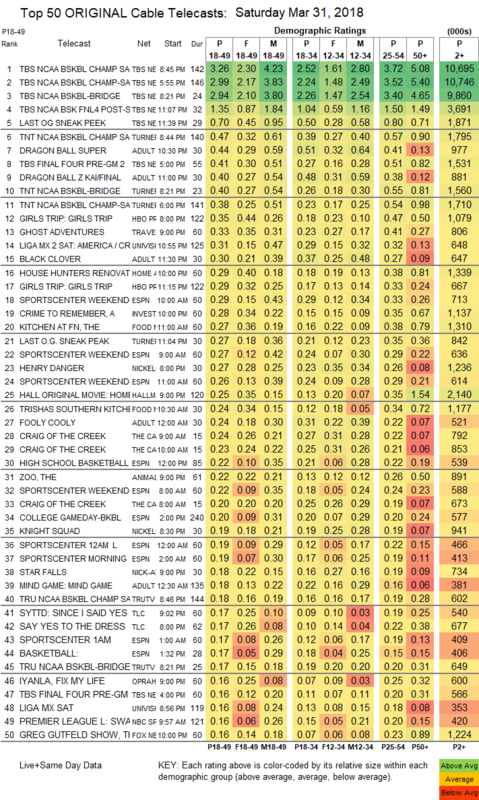 CABLE HIGHLIGHTS: TBS’s coverage of the Final Four NCAA TOURNAMENT games naturally led Saturday cable at 3.26/2.99, with its sister networks airing the games featuring local team announcing tracks, TNT at 0.47/0.38, and Tru at 0.18/0.15. TBS followed the late game with a “sneak peak” of the pilot for THE LAST OG, which got a strong sampling at 0.70, with a simulcast on TNT at 0.27. Adult Swim switched up some of its late-night line-up, which performed as follows: DRAGON BALL at 0.44/0.40 compared to last week’s 0.45/0.37, BLACK CLOVER up 0.03 to 0.30, FOOLY COOLY at 0.24, MIND GAME at 0.18, JOJO’S BIZARRE ADVENTURE down 0.06 to 0.15, HUNTER X HUNTER down 0.06 to 0.16/326K, NARUTO down 0.08 to 0.16/305K, SPACE DANDY down 0.06 to 0.16/319K, COWBOY BEBOP at 0.16/300K compared to last week’s 0.22/0.20, and GHOST IN THE SHELL down 0.05 to 0.14/287K. Travel Channel’s GHOST ADVENTURES ticked down to 0.33. Univision’s LIGA match was at 0.31. HGTV’s HOUSE HUNTERS RENOVATION ticked down to 0.29. ID’s A CRIME TO REMEMBER gained 0.05 to 0.28. On Food Network, KITCHEN AT FN rose 0.03 to 0.27, TRISHA’S SOUTHERN KITCHEN rose 0.05 to 0.24. Hallmark’s original movie HOME BY SPRING was at 0.25. On TLC, SAY YES TO THE DRESS and its follow-up hour were both at 0.17, compared to last week’s 0.20/0.18. On OWN, IYANLA FIX MY LIFE lost 0.03 to 0.16, and BOOK OF JOHN GRAY was down 0.02 to 0.10.